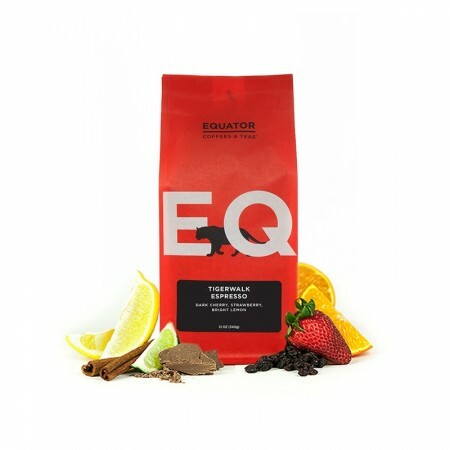 The Tigerwalk Espresso was carefully roasted for you by Equator Coffees & Teas. Tigerwalk Espresso features three fully washed coffees from Latin America and East Africa. Together these coffees work together to create a well-balanced, creamy espresso with notes of cherry-toned chocolate, strawberry and lemon. Had trouble getting past the deep roast to find a drinkable cup. Found it kinda funny that this espresso blend comes with a recipe on the package.... for pour over. When originally pulling shots of Tiger Walk statements of "How is this rated well!?" went through my head. I was getting great shots visually, but when putting my nose to it and drinking it it was coming out ashy and dark. I have found that more developed beans have challenged my normal routine and I have to focus and reiderate how the shot is extracted. A lower temp and shorter shot of this has done the coffee well and I now enjoy it. A creamy shot for sure with some sweetness and darker fruits. Patience with this one is key and you will be rewarded. A nice citrus and spice taste for the first 6 days after roast. I was pleasantly surprised with this espresso! I wasn't the dark bitter stuff. It was exceptionally well balanced with a surprising sweetness and brightness I enjoyed very much. I used an Aeropress. I would buy this again. A little "light" for my taste. Not bitter nor acidic but could use more flavor. My rating applies strictly to the results as espresso. It did produce a lovely looking shot with a creamy body, but I found the taste too sharp/citrus. Better brewed in an Aeropress. Full bodied, and slightly nutty, chocolaty flavour. Worked nicely as straight up espresso, a latte, and french press. The Tigerwalk is soooo good! This is definitely our office favorite! Great crema and very well balanced. Not as good as the last bag, but one of my favorites so far. We don't normally enjoy fruity coffees but this had more citrus notes rather than a strong fruit flavor. We enjoyed this blend. Bright berry notes at the beginning with an excellent smooth silky chocolate taste in the after taste. Very balanced and extremely delicious. Enjoyed the berry notes, but was too chocolatey for my preference. Made a small batch of cold brew with this and the milk chocolate really stood out, but again, my preference is not creamy/chocolate.Overall, great coffee! Such a fragrant roast- even through the shipping box the aroma calls out to you. I'm still a novice at espresso making so the adjustments took a little while. When I finally got it in range, good things started happening. One cup had bright citrus, the next intense cherry chocolate flavors. The cherry chocolate flavor really lingered. I look forward to hitting the sweet spot with a balance of the citrus and chocolate flavors. It's definitely a fruity blend, so if that's not your thing then you'll want to pass. Ok for espresso, but not my favorite latte. I like that it's rich in taste and quality, but a little too fruity for my taste! Great balanced flavor! with a nice mix of dark chocolate and a bit of fruit/tartness to balance it out. My favorite coffee thus far. This has a wonderful semi sweet flavor. I grind beans for espresso over ice and a touch of milk. It needs no other sweetner!! The coffee is good, but the citrus makes it have a bit of an edge that I don't prefer. A great espresso coffee that Is light and floral but strong enough to hold its flavor when used for lattes. I have enjoyed having this coffee, but would prefer a blend with more chocolate and nut emphasis and less fruit notes.